RAWALPINDI - Foreign Minister of Japan Taro Kono says his country looks forward to enhanced security cooperation with Pakistan especially in the field of counter terrorism. He was talking to Chief of Army Staff General Qamar Javed Bajwa in Rawalpindi today. 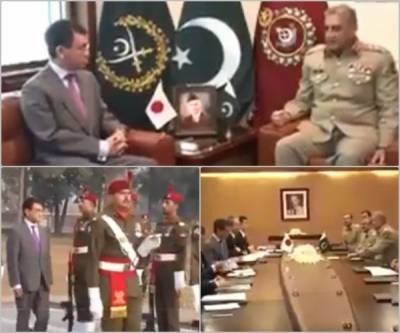 The Japanese Foreign Minister informed the Army Chief about assistance of his country in rehabilitation of TDPs and provision of scanning equipment for border crossing points. The Army Chief thanked Japan for acknowledging Pakistan’s efforts towards regional peace and assistance in counter terrorism domain. The Japanese Foreign Minister was briefed on Pakistan’s War on Terror and contributions towards regional peace. The Japanese Foreign Minister appreciated and acknowledged Pakistan’s efforts towards regional peace and stability.